MARION COUNTY, Alabama – A 462-acre industrial park off the future Interstate 22 stands as a symbol of cooperation in this northwest Alabama county, and officials believe that this teamwork approach will help the region along the state’s newest superhighway land new jobs and investment. Until recently, the Interstate 22 Gateway Industrial Park had a split personality. Actually, the site held two adjoining industrial parks, one belonging to the city of Winfield and the other to the adjacent town of Brilliant. Prospects viewed the parks as disconnected and separate, making them virtual competitors. “It was always awkward that we had two parks of similar size that share the same roadway access and utilities yet were in two different communities,” said David Thornell, president of the C3 of Northwest Alabama Economic Development Alliance, a partnership uniting Marion, Fayette and Lamar counties. Not any longer. The consolidation of the two community-owned sites into the Gateway Industrial Park has created the largest industrial site along I-22’s route in Alabama, making the location more suitable for large projects and streamlining marketing efforts. Asking prices at the site have been reduced to $9,500 an acre to make the park even more attractive. “This is a great example of cross-community cooperation,” Thornell said. Gateway Park flanks three sides of the Exit 30 interchange on the future I-22 (now officially called Corridor X, linking Birmingham and Memphis), and the site is prepared for development, Thornell said. Access roads and utilities are in place, and two large fueling stations and a Hampton Inn stand nearby. Thornell said Gateway Park is being marketed to auto parts makers because of its proximity to the Toyota assembly plant near Tupelo and the Mercedes-Benz plant in Tuscaloosa County, both about an hour’s drive away. He thinks the park also would be ideal for distribution operations, metal fabricators and the makers of construction and farm equipment or recreational vehicles. “All the park needs is for a company to call it home,” Thornell added. 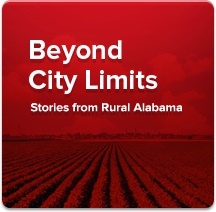 What’s going on in Marion County aligns with the goals of a new rural economic development push in Alabama that calls for a greater level of cooperation and a regional teamwork approach to overcome obstacles facing smaller communities competing for projects. The Economic Development Association of Alabama and the Alabama Department of Commerce are spearheading the strategic approach. Steve Foshee, chief executive of Tombigbee Electric Cooperative and chairman of C3’s strategic planning committee, said having neighboring industrial parks at Exit 30 reflected what some call “Friday night football syndrome” – in essence, the two local teams were lined up and going head to head. Before that happened, though, the problem was brought home when an overseas industrial prospect came calling to inspect the Winfield and Brilliant sites off Alabama Highway 129 at Exit 30. “They couldn’t understand how we went from one town to another. You could see the confusion in their eyes. You don’t want confusion at that stage. It was a lesson learned,” Foshee said. The industrial prospect didn’t pick Marion County. Later, in strategic planning sessions, the dual identities of the Winfield and Brilliant sites were pinpointed as a key shortcoming, underscoring the need to unify them as a single entity, Foshee said. A consultant brought in by C3 made the recommendation. Leaders in Brilliant, a town with around 730 residents and a coal mining heritage, and Winfield, a city of about 5,000 known for its popular Mule Day festival, embraced the idea. The I-22 Gateway Industrial Park was born. Thornell and Foshee said the spirit of cooperation that linked the two community-owned industrial parks has been growing in the region since the founding of the C3 organization more than three years ago. 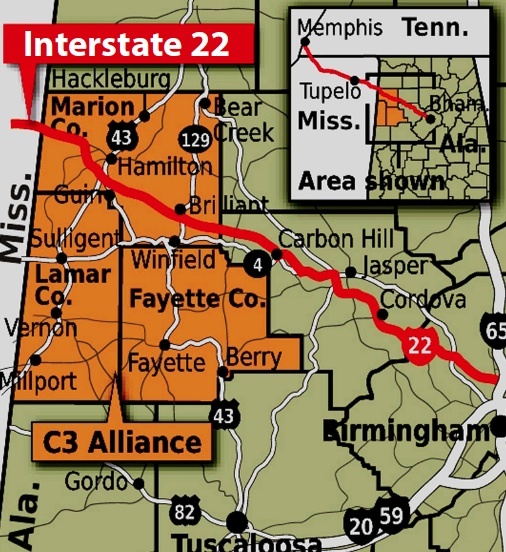 C3 was designed to provide a single point of contact for prospects and create an economic development brand for Marion, Fayette and Lamar counties. 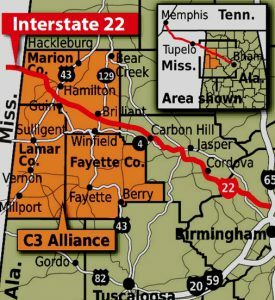 Thornell believes the cooperation that made the I-22 Gateway Industrial Park possible should send a strong message to prospects, site selection consultants, regional commercial real estate agents and others that C3 communities are working together as a team. “Because we work together, we create a more inviting and desirable environment to attract prospects and to support the success of businesses that consider locating here,” Thornell said.